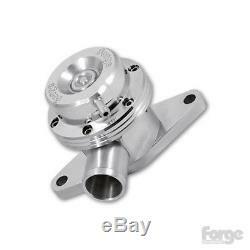 FORGE Subaru Impreza V5 Piston Ram Closed Loop Dump Valve (Flange Mounted) FMDVV5013 Product Description Alloy Recirculating Ram Dump Valve, flange mounted available to fit the Impreza V5. Made from billet aluminium, this recirculating diverter valve dumps the charge-air back into the air intake system keeping external noise to a minimum. This increases both quicker throttle response and higher clamping load to maintain boost pressure more reliably. In The Box: 1 x FMDVV5013 Valve 1 x Forge Sticker. We are dedicated to ensuring the highest possible quality service to our customers, always going above and beyond! For most items, you have the right to return your goods within 30 days of receiving them. However, this right does not apply to items that have been altered upon request, have missing labels or show signs of being used. If you wish to return goods using this right, you need to inform us within 21 days of receiving the goods. You must take reasonable care of the goods and immediately return them at your own expense. Please ask for a "Proof of posting certificate" as we cannot be held responsible for goods that go missing whilst in transit. If you think weve sent you the wrong item or size, please double check the full description in the listing, including the UK size before requesting a return. The item "FORGE Piston Ram Closed Loop Dump Valve for Subaru Impreza V5 FMDVV5013" is in sale since Friday, September 16, 2016.